Conveniently close to the U.S. mainland, Cozumel offers sparkling clear warm water, an easy drifting current, a diverse array of intriguing marine life, tower coral formations, and spectacular walls for snorkelers and divers of all skill and experience levels to explore. From the novice student on their first open-water dive to the seasoned Cozumel expert, the more than 20 miles of the western fringe reef offer magical moments that become treasured dive memories. Cozumel, the oldest island in the Caribbean group, encompasses far more than you can ever imagine; caverns, sand chutes, fissures, and more. Visibility varies from 80-100 feet (24-30 meters). Nestled six miles off the coast of Mexico’s Yucatan Peninsula, Cozumel, known as the “Island of Swallows” is a sub-tropical diver’s paradise. Cozumel, Mexico’s largest island is fast becoming one of the world’s most prestigious scuba diving destinations. 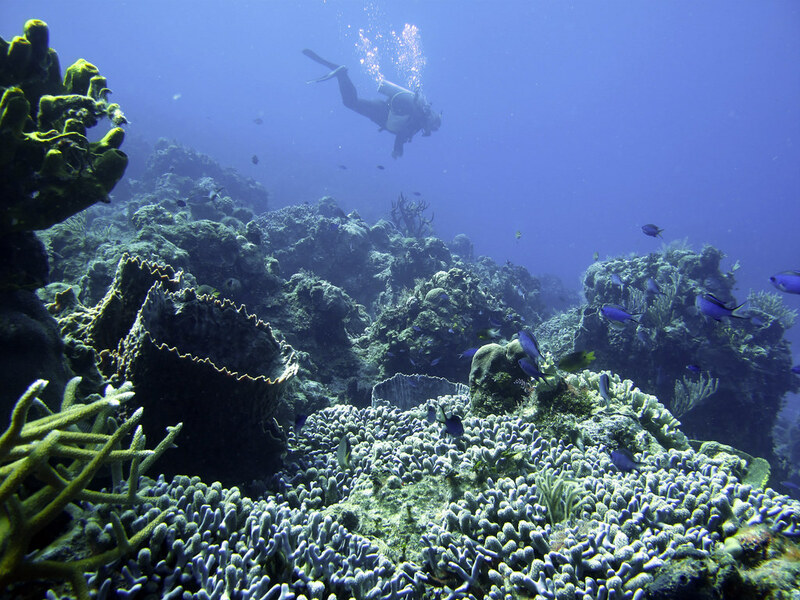 There are more than 30 charted dive sites on the western side and southern tip of the island. The majority of the most spectacular dive sites are located within Arrecifes de Cozumel National Marine Park. The park was created in 1996 with the goal of protecting a substantial portion of the largest barrier reef in the Northern Hemisphere and the second largest barrier reef system in the world, the Meso-American Reef System. Home to more than 26 types of coral with over 100 subspecies, 500 different fish species including Butterflyfish, Angelfish, Parrotfish, and Damselfish, you won’t be disappointed. Giant Elephant Ear Sponges, spectacular Elkhorn Coral bouquets, darting schools of brilliant tropical fish, huge Buff Tube Sponges, Fire Coral, Stovepipe Sponges, Eagle Rays, Sea Whips, and mystical waving fan-shaped purple sponges delight the diver’s eye. Spectacular Toadfish, Cozumel’s signature species, flourish in the clear waters. Featured creatures include Lobster, Octopus, Snapper, Grouper, and large Barracuda. The island boasts an international airport for commercial flights and private jets. Guest accommodations include upscale resorts, charming bed and breakfast lodges and cozy beachfront bungalows. Visitors enjoy American, Mexican, and Continental fine dining options, exciting nightlife, unique shops, and intriguing Mayan archaeological sights. Recreational opportunities include swimming, hiking, deep sea fishing, wind surfing, para-sailing and more. Pack plenty of sunscreen and a hat. The weather is mainly sunny with temperatures averaging 70-to-85 ºF (21-29 ºC) with humidity of about 90%, mitigated by frequent breezes. It pours down heavily during the rainy season of September through November. Otherwise it rarely rains. Water temperature is about 77 degrees Fahrenheit during the winter, about 85 degrees in summer (25 to 29 ºC). Island dive visitors should take PADI Deep Diver, PADI Drift Diver, and Peak Performance Buoyancy courses before exploring the spectacular walls. The PADI Cavern Diver course is also a recommended choice for sites with swim-throughs.